Mediterranean based Mojito is a Moody 64 Performance Cruising Yacht, launched in 2002 and is in immaculate condition having always been maintained by a professional crew. The owner has spared no expense in keeping her in perfect order. Sailing yacht Mojito is a high performance yacht capable of fast and exhilarating blue water sailing as well as shallow water cruising due to her shoal fin keel which allows her into bays and inlets usually inaccessible to boats of her size. 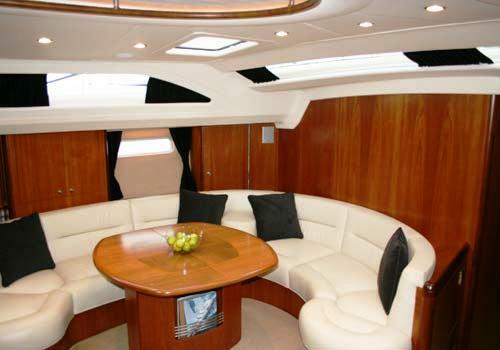 Mojito has a contemporary and stylish interior with comfortable accommodation for up to 7 guests. 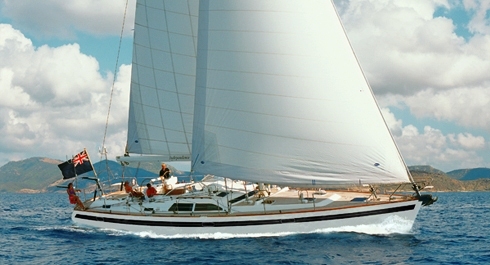 This beautiful sailing yacht is best suited to 2 couples with 2-3 children. 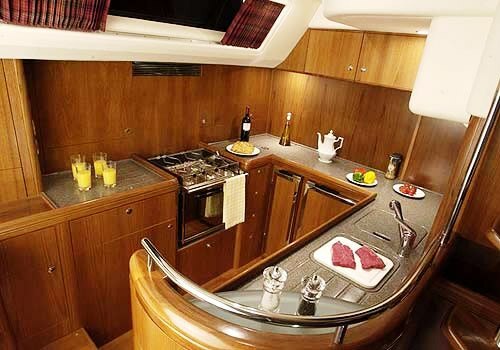 Dinning is possible either in the main saloon which has an extendable table or in the cockpit for el fresco style meals shown in the photo below. Her deck Barbeque is perfect for lunch or dinner! The yacht also offers glorious teak decks with integral deck cushions forward and aft for you to choose the best sunbathing spot. Teak seats at the bow and stern are perfect for surveying the scenery and spotting sea life. Sailing yacht Mojito also has twin Helms so you can help sail the performance cruiser, or instead relax under the full bimini which protects from the midday sun. Mojito’s swim platform has a fresh water shower. Her crew consists of 2 including her first-rate British captain who has extensive knowledge of the Mediterranean and will ensure your guests an amazing charter! 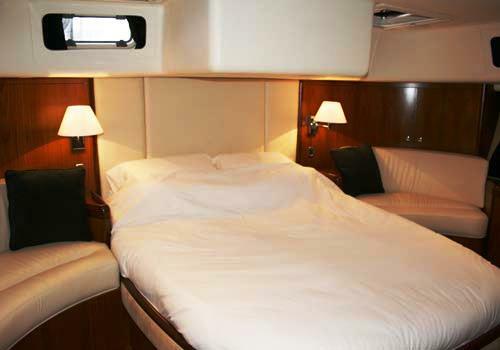 Western Mediterranean based Mojito can accommodate up to 7 guests in 3 staterooms. 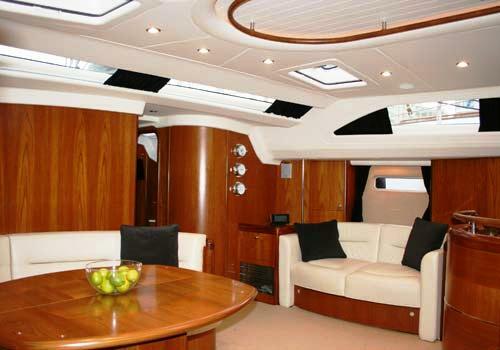 Her full width Master cabin is located aft. 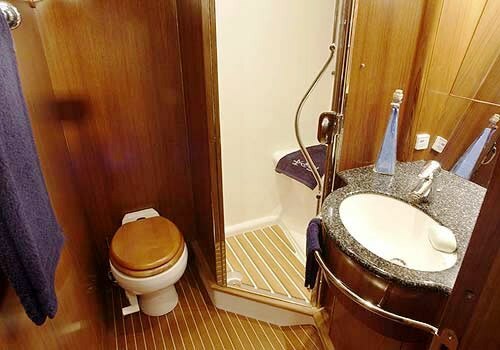 A further double guest cabin and twin guest cabin are located amidships, all with ensuites facilities. There is a pullman berth in the study by the master cabin, best suited to a child. Crew accommodate is forward of the yacht. 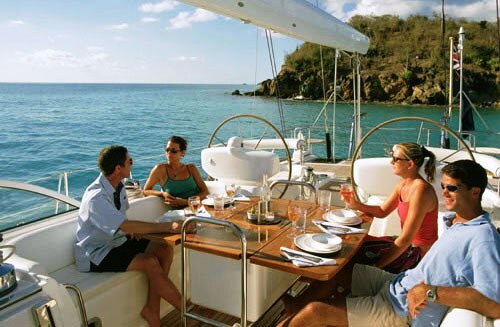 Western Mediterranean sailing yacht Mojito provides the following equipment and amenities: DVD Player, flat screen TV, iPod (3000 tracks), PLAYSTATION and surround sound in Saloon. Main cabin has separate flat screen TV and music system. A Powerful 50hp Mercury engine, on a 4 meter Avon tender, Fishing gear, O'Brien Twin / mono skis, O'Brien 4 man ringo, Liquid Force wakeboard and bindings, TUSA Liberator Masks, TUSA Liberator Snorkels, Typhoon Tornado Foot Fins.